French Wedding Toast Glass for Bride and Groom. Free third glass for a special toaster, gift, or decoration. These champagne glasses for the perfect memento from your special day. 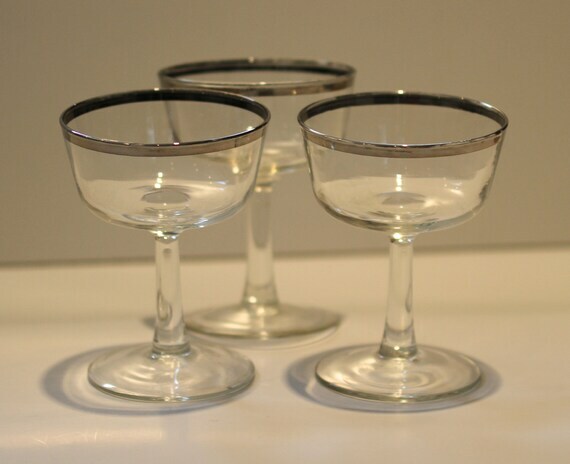 Add some unique vintage sparkle to your holiday table with these platinum / silver rimmed champagne ~ sherbet glasses. These lovely glasses feature a wide platinum or silver band encircling the rim, atop a classic smooth stem. No dings or scratches, and all are in excellent vintage condition. Classic and elegant stemware! Each stem stands 4 1/2 inches tall, and holds 4 ounces. This entry was posted in http://feedproxy.google.com/~r/JujubefunnyFinds/~3/ti0ObcluHNY/champagne-glasses-with-silver-platinum1376212227.87 and tagged IFTTT. Bookmark the permalink.